Sadiq Khan warned of tougher online regulations if companies like Facebook and Twitter can't forge a relationship with governments. There must be greater responsibility by technology companies for the impact they’re having on the world, London Mayor Sadiq Khan has stressed. The former human rights lawyer took to the SXSW stage in Austin, Texas, on Monday to share his vision for a "better, more inclusive future." Khan underpinned his fear of perpetuating an online platform of hate by reading out some of the tweets trolls have thrown at him, including, "I say kill the mayor of London and you’ll be rid of one Muslim terrorist." He said: "I don’t read them out to be portrayed as a victim. What happens when young boys and girls from minority backgrounds see these on their timelines? We simply must do more to protect people online. Facebook and Twitter and other platforms are finally starting to react to the criticisms. But with the skills and resources the companies have at their disposal, I believe it’s possible to go further and faster." 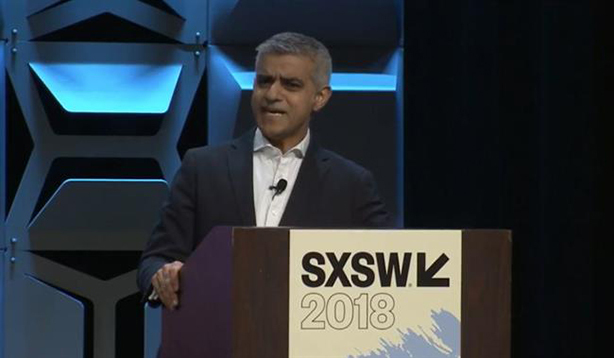 The mayor spoke of an "increase in disconnect and disillusionment" of many communities among Briton, fueled in part by social media and the tech revolution. "The dominant characteristic is the unprecedented scale and speed of change driven by technology," he explained. "We see it all around us. Technology is disrupting and shifting the way we do everything: the nature of our economies and the types of jobs available, where we live and how we travel, the way we consume news and the way we're communicate with one another. How we deal with this transformation will be a defining challenge of the 21st century because it cuts across so many layers of our society. "Understandably, there are concerns about they ways some of the biggest firms on the planet are impacting our lives. These new platforms have been used to exacerbate, fuel and deepen the divisions in our community." Khan added it "should worry democracies around the world." He admitted that politicians have been sitting on their hands while the tech world has exploded around them, and said "we all placed too much faith in the vision of great tech pioneers." The stronger duty of care that he strives for will be the responsibility of governments and Silicon Valley working together for change. If relationships between the two can’t be forged, Khan warned of tougher regulations similar to the rules Germany has recently put in place. Tech firms which fail to remove content like hate speech now face hefty fines. But as a big proponent of free speech, the mayor doesn’t back strict regulation. "The good news is that we’re only just at the beginning of this journey and if companies and politicians at all levels of government can work together to shape the future of tech, then I remain optimistic that we can utilise technology to create more united cities and countries, and optimistic that we can work together to instill hope for a better, more inclusive future for us all." Khan also touched on how he envisions tech playing a pinnacle role in dealing with the London housing crisis (like many cities, it's unaffordable). He said super-fast broadband should be essential for new developments as flex-work becomes the norm. The mayor won huge applause for beautifully summing up the UK/US relationship with Donald Trump at the helm. He said: "
Our relationship with the US is unique we’re best mates. When you have a best friend, you stand shoulder-to-shoulder with them in times of adversity. But if you can’t call out your best friend, if you can’t say to your best friend, ‘listen mate, you’re bang out of order,’ then they’re not really your best friend. "If you’re president of the USA... you’re a beacon of pluralism, liberalism, really good values, and I just think it demeans your great country when your president tweets the stuff he does." When ad giants like Unilever question their social spend, does it presage a shift to 'earned'?